Yesterday evening I pulled out my 1990 diary from the dusty old mini-cupboard it’s been in since...well, since December 31, 1990, I should think. It’s the first of my 18 diaries, most of which have entries on every page. The ritual began almost by accident when I was 12 years old. In late 1989 my grandparents, aware of my Mahabharata obsession, ordered a diary for me (I’m not sure about this, but I think it came with a subscription to India Today). 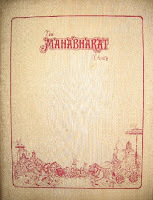 It had a graceful cloth binding and a velvety bookmark, and told the story of the epic in very basic, Amar Chitra Katha-like prose and illustrations – the pictures and text took up the top fourth of each page, while the rest of the page was for entries. Initially I thought of it as a nice decorative item (it didn’t work as a book; I already had far more extensive versions of the Mahabharata), but at some point on the night of January 1 it occurred to me that it might be fun to actually write something in it. And so it began. In my terrible, no-chemist-could-read-this scrawl, I wrote the opening sentence: “Today was the first day of the year, and I was so excited!” The entry went on to mention games of cricket and hide-n-seek played with a long list of neighborhood friends, many of whose faces I can’t even recall today; the buying of audio-cassettes (the soundtracks of “Chandni”, “Mitti aur Sona” and “Khoon Bhari Maang” among them) and books (Somerset Maugham's The Razor's Edge, an Agatha Christie); and the evening viewing of what I described as “the movies Star Wars parts I and II, and a part of Star Trek IV”. In all, the entry was around 200 words long, written in full sentences, no shorthand, though I misspelt the word “tuitions” (“tutions”). Soon I was addicted to journal-writing and this was the beginning of a habit that would last 16-and-a-half years. Between January 1, 1990 and June 2006, I wrote an entry every night. It was usually just a log of the day’s events, with maybe a few “deep” thoughts scattered here and there, and the occasional jokey philosophical aside, but it was a very important part of my life, helping me to organise my thoughts, make some sense of the things (however seemingly insignificant) that happened each day. Whenever I went anywhere for an overnight stay, the diary was the first thing I would pack. Friends, especially the ones who weren’t really into reading or writing, would give me amused looks when I took the thing out at the end of a late-night chat session. (I think it was perceived as a girlie thing to do.) Buying a new diary featured at the top of my to-do list in the last week of every December (it wasn’t always a straightforward task because many stationery shops kept only executive diaries where Saturdays and Sundays have to share a page, whereas I needed one that had a generous amount of writing space for each day of the week). None of the post-1990 diaries were as colourful or as good to look at as the Mahabharata one, but that no longer mattered. A year and a half ago, I finally discontinued the daily writing. The main reason was that I was writing too much anyway (at the time I was doing between 12-18 stories/reviews/columns per month, in addition to a large amount of blogging) and feeling jaded; I had to cut down on something. Also, I had begun to question the usefulness of the diary-writing. Over the years, there were times when it had become a chore – I was doing it not because I had something interesting to write about (or an interesting way in which to write it) but simply because it had to be done. I frequently treated it as something to finish before going to bed – a quarter-page of scribbled lines, dashed off in two or three minutes, which said nothing much more substantial than “Got up at 7. Spent most of the day reading. Went for a walk in the evening” and suchlike. It made sense to stop. 1990 was also the last full year of my childhood obsession with Bollywood. 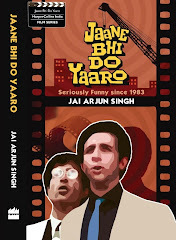 (It was in mid-1991 that I became sated with Hindi films and began looking elsewhere for my entertainment – more on that in this post.) But what a magnificent obsession it was! It’s common knowledge today that some of the crappiest Hindi movies ever were made in the late 1980s, but I have very fond memories of most of them; for some reason, nothing makes me more nostalgic than thinking about the early Salman Khan films that followed Maine Pyar Kiya (Baaghi, Sanam Bewafa, Pathar ke Phool, all of whose soundtracks I loved), though I wouldn’t want to see any of them again today, and though I wasn’t a Salman Khan fan at the time. (I used to look down on my friend Amit, who was.) In the 2-3 years leading up to and including 1990, I watched nearly everything, rushing to the nearby video library every Friday afternoon for prints of the latest release. (One randomly picked Friday entry gushes: “Din Dahade, Gunahon ka Devta and Solah Satrah have all released today!” Does even Great Bong remember those films?) I also indiscriminately bought audio-cassettes of any movie with a halfway-decent (or halfway-terrible) soundtrack, and the diary carefully records all this. In between all the cheerfully plagiarised badness, there were of course gems like the Lekin soundtrack (“Yaara Seeli Seeli”, “Kesariya Balma”), which for some reason I still associate with the taste of the Cadbury “silky” chocolates that were briefly available in those days. I can go on, but I’ll stop here – just realised that I still haven’t bought my 2008 diary. Am strongly motivated to do it now. Also, a couple of resolutions: to get back to journal-writing, not daily but at least once every 2-3 weeks; and to go through my other old diaries, beginning with the 1991 one. Who knows what dastardly things I’ll discover about my life and times. Now I am all nostalgic. Just like you, I have been keeping a diary since childhood, but unlike yours, most pages of my diary are blank. I stopped filling up pages with the day's activities and wrote only on days when I had something important to write like a philosophical passage or an opinion or some thoughts. I too discontinued this ritual questioning the use of it all. Now that I read your post and found out that when you read a page in your diary, you get a different glimpse of your own self, the temptation to pick up this habit again is rising. May be I will buy a 2008 diary after all. You know what I'm going to say, don't you? I have that exact same diary; only difference is, my mum bought it, and gave it to me for my wedding, with recipes written in it. It is also a part of growing up - this ability to detach oneself intellectually and with that the ability to sublimate and transform personal feelings into something that is "objective" or at least something that is general and may be of interest to others. 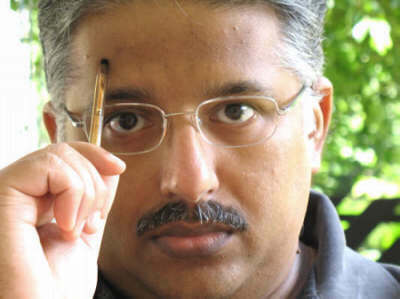 Alok: I agree, but for me personally there's a strong distinction between the diary-writing and the personal posts on the blog, and I can't think of the latter as a grown-up extension of the former. They serve different needs. At the most basic level, I'm much more candid and earnest about my feelings in the diaries - whereas in the blog I tend to use distanced humour to deal with the things that make me uncomfortable or unhappy. Rereading some of the old diaries showed me that the non-public writing has its own purpose (again, speaking for myself). Apart from being good reference points in general, as I mentioned in the post. Space Bar: one of us is definitely redundant. But happy new year anyway. I stopped filling up pages with the day's activities and wrote only on days when I had something important to write like a philosophical passage or an opinion or some thoughts. Anaamica: my wife says she used to do the same - writing only when she absolutely had to express something. When we were looking through my 1990 diary yesterday, she felt it was a better idea to be regular, because you end up recording so many little details that way, which are interesting to revisit later in life. I started keeping a diary only 2.5 years ago when I was 20. I think I did think of it as a girlie activity when I was a kid. I realised that mostly I was writing about relationships and quite irregularly. A daily routine is almost impossible for me to follow. It's more like I want each entry to mean something, than be just everyday routine stuff. At the most basic level, I'm much more candid and earnest about my feelings in the diaries - whereas in the blog I tend to use distanced humour to deal with the things that make me uncomfortable or unhappy. Totally agree! Moreover, I personally feel diaries are a good way to track some then silly moments but significant to remember today. Haha. In 1990 when I was 9 I made a diary in which I created a secret code language with symbols resembling Egyptian hieroglyphs or some extraterrestrial language. 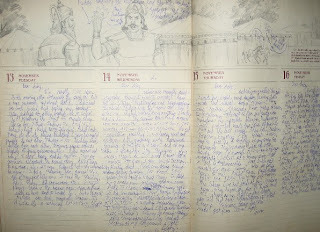 The diary also had odd pieces of information that I read about in encyclopedias but it was never my cup of tea to maintain a daily diary despite the suggestions of various elders to do so as it improves one's language etc. Diaries are great diagnostics. You can see recurring problems (your life, relationships) much more clearly when you have a record. Also, you can be painfully honest with yourself in the private one. Reading this brought back memories...My first diary was a disney diary with a cute little lock that anybody could pick. I was around 7-8 around that time and wrote things like 'I was sad that we did not have the hindi test today'. Looking forward to lots and lots of wonderfully thoughtful and hilarious posts in 2008. Great post. Made me nostalgic... Came here through a friend--Paresh. I don't have old diaries to go back to. In a fit of anger and angst, I got rid of them - in fact I dramatically burnt them (so filmi - even at 18). Part of me is glad though. The tiny part that doesn't want to deal with how awful certain years can be.. and how embarrassing one's pontification can sound years later..
Lovely post - and no - we don't go away just because you ask us to. I personally hate going back and reading old diaries. I don't think I ever recorded events that took place, mainly things I was worried about. And those worries seem very minor and pathetic now. salman rushdie was right when he qouted that writing preserves slices of our life ,it does indeed ,diary writing thaough monotonous brings it pleasure in reading and recollecting it later ,but requires persistence . so please do continue your diary writing they are etchings of your past ,all the best . Can relate so much. I was always the diary types right from childhood and stopped it only when I was a couple of years into my working life. The reason being I didnt get enough time and certainly not enough privacy to write things on my own terms. I started blogging, but then that has never been synonymous to diary writing for me. I still have all my old diaries and I abs love going through old times and retouching those memory cells in ones brain where everything again becomes fresh. It's yesterday once more.